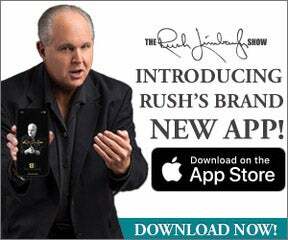 RUSH: I mentioned this at the very top of the program yesterday, didn’t delve into it, but we have an addition on a new feature that we have at RushLimbaugh.com, the Meet Rush feature. If you go to the home page and you see the iPhone graphic there, if you click on the lower-left hand app, there’s a graphic made to look like an app, it’s called Meet Rush. And if you click on that you’ll be taken to an area where you can submit a question, a little biographic summary of yourself. And then submit a question. We go through all of these and we pick some. And we get in touch with people that we choose to do a video conference with staff here at the Meet Rush staff. And we talk to you about what you like about the program, how long you’ve been listening, all that, and give you the chance to ask a question that you would like the answer to, either about me or about the program. You know, I’ve been talking about this a long time. We’ve been accepting the submissions from people. These are the things I have said that are some of the best questions I’ve ever seen. And virtually all of them — I haven’t been asked any of these questions by media people during interviews. You know, most of my interviews in media basically center around one premise: What gives you the right to breathe? Who the hell are you? Why do you think this about that? Why do you think this about that person? And it’s been phenomenal to learn how many people have been listening for over 20 years, some of them all 30, and the memory, the memories they have of things that happened 25 years ago, it’s just great. It’s been extraordinarily gratifying. And it has confirmed a lot of the instincts that I’ve had about you in the audience and your relationship to the program. And I went into the studio the other day on the Dittocam, and I answered about eight to 10 of these questions, and we’re gonna be doing this frequently. And as we edit them and get them ready, we post them. And so yesterday we posted a couple more videos with questions and me answering questions that people have had. It’s not gonna end. There’s a constant supply that’s being replenished throughout the month and we’ll add them occasionally, but they’re there, and they’re there for posterity. Also, we have been having some issues with the iPhone and Android phone app not updating correctly. In some cases it was showing old content to some people for a couple of days. But our developers worked on it and it seems like now it’s working normally. And we’re so close to another major update to the RushLimbaugh.com app which is going to greatly simplify the access to and the downloading of podcasts. We’ve been beta testing it, and we are off and running on this. I don’t know when it’s gonna be, but it is relatively soon because we’ve been, as I say, beta testing it for over two weeks. And you can be rest assured that when it’s ready, I will be heralding that fact, and some other things along with it, too. But we hope to be updating the app on a regular basis. You know, I have certain apps on my phones, and I really appreciate frequent updates because it shows me the developers are paying attention to it, they’re constantly trying to improve it, but more than that, they’re aware of the way people are using it and how to upgrade it, you know, bug fixes, performance updates, but actual feature additions, too, which we want to do all of. And we’re paying a lot of attention to it. The app is free, and there’s plenty you can access on the app on the free side of the web. You don’t have to be a member. 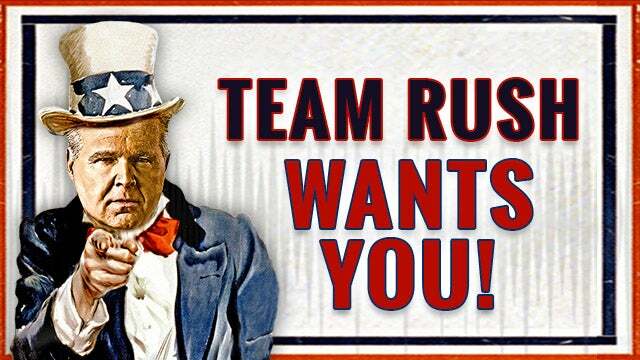 But if you do join and become a subscriber, then the world of RushLimbaugh.com opens up, and there is content galore. But even on the free side you have access to transcripts of everything that is printed at RushLimbaugh.com. You don’t have any audio, you don’t have access to the Dittocam, but you have access to the transcripts. And you can share them with people that you think need to see or read what you heard on the program. And there is access to some video content, highlights from Rush Limbaugh the TV show, some highlights from the Dittocam and so forth. There is some video there. There’s a lot of value that is offered on the free side. And the app is free. All you have to do is go to Rush Limbaugh, search “Rush Limbaugh” in the iOS App Store on the Google Play store, and it’ll pop right up. And we designed this app for a dark black background and primarily, two reasons. A, aesthetics. I mean, it looks great. But it also is designed to save battery life on the new iPhone X, which whenever there’s black on the screen, the battery is not used because there’s no light. With the iPhone 8 and previous, even blacks use a light because the screen is constantly lit with what’s called a backlight. That’s a feature of an LCD screen. The iPhone 10 has a new OLED screen, organic light emitting diode is what it stands for, but the point is that only the pixels with color light up on whatever screen. So we’ve designed this with a lot of black, which means that it will save a lot of battery energy on the iPhone X. And of course whatever OLED screens you might be using if you have an Android phone. And during this spiel I just got a flash message from Koko claiming that the app has been fixed, the aspect where people were updating and still old content was displaying. That has been fixed and it is now running normally.